Swimsuit, sunglasses, beach towel, sandals and relaxing on a sunbed. 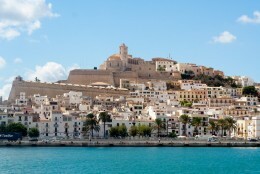 It is all you need this summer to enjoy these four fantastic beaches in Ibiza, and with beach bar included. 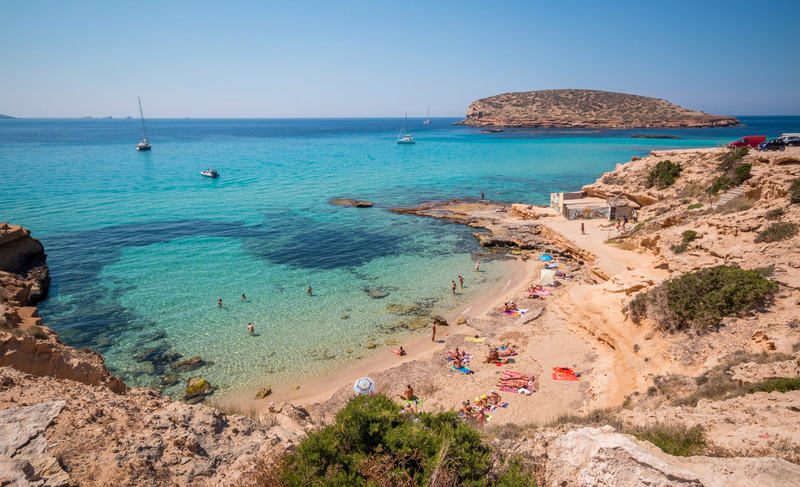 At Platges de Comte, more known as Cala Conta, we find Racó d’en Xic, a secluded small nudist beach cove with turquoise waters. It is the smallest beach in the area of ​​Comte and it’s located on the far left part. An ideal place to relax and take a swim in a tranquil and peaceful atmosphere, as well as it’s perfect for snorkeling, as there is a rocky wall with lots of marine life. As well, there is a typical small beach bar where you can have a refreshing and delicious mojito while enjoying the sunset. 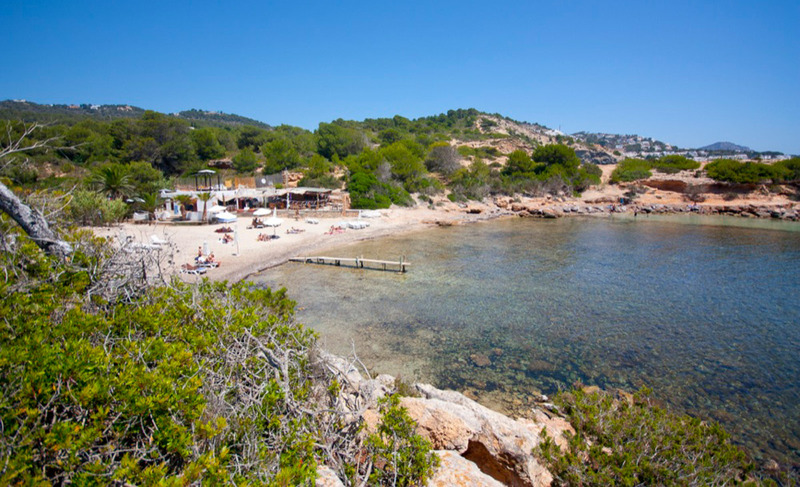 It is a small, secluded but very charming Ibizan beach with a marine touch. It is located about 5 km from San Antonio towards Santa Agnès. A charming and peaceful beach cove that still preserves its natural state, with crystal clear waters and fine sand. But if you wish to dine you have to go to the beach of Cala Salada, just at the other end, where there’s a traditional beach restaurant specialized in fish and rice dishes. 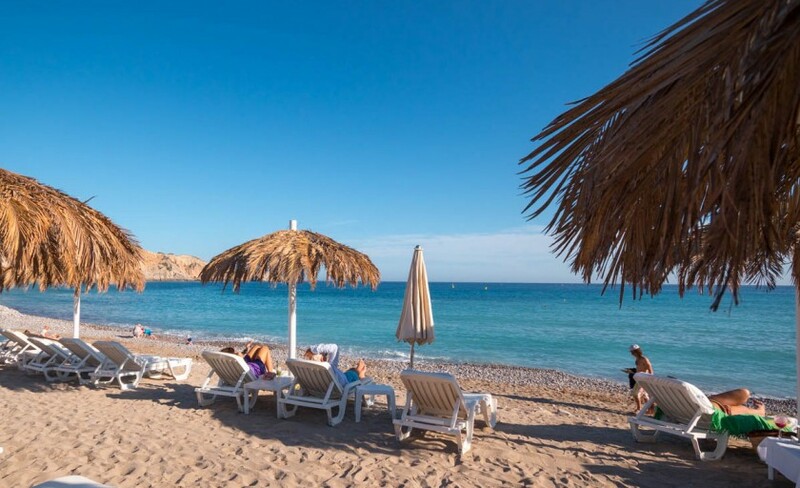 Now let’s head to the beach of Cala Carbó, located between two other fantastic beaches, Cala d’Hort and Cala Vadella. Certainly a great choice for enjoying a wonderful day of sun and sand. This little cove has a very Ibizan and Mediterranean look, protected by hills and surrounded by pine trees. With a mix of sand and round pebbles, crystal clear waters, a wild nature touch and a very quiet and family atmosphere. There are two fabulous seafood restaurants: El Balneari and Can Vicent, where they cook exceptionally well all the sea treasures that the sea of ​​Ibiza offers. S’Estanyol is a tiny and cozy beach cove on the coast of Santa Eulalia, in the area of ​​Roca Llisa and next to the beach of Cala Llonga. It is an unspoilt cove perfect for those looking for a quiet and peaceful place. 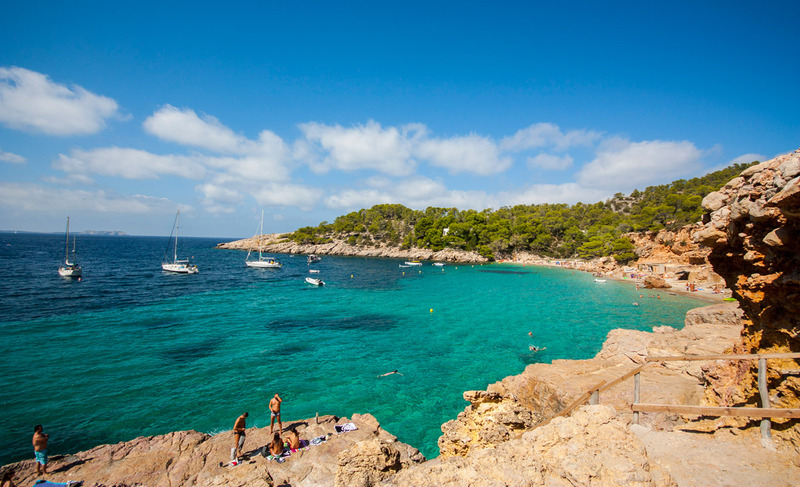 Sand, rocks and turquoise waters…Very Ibiza-style! A beach for everyone where it’s not unusual to occasionally find nudists. One of those unique spots that the island offers. There’s also a beach bar where you can have a bite and a drink.